WASHINGTON (AP) — The Washington Nationals need starting pitchers beyond Max Scherzer to excel if they’re going to make a run at the Phillies and Braves in the NL East. 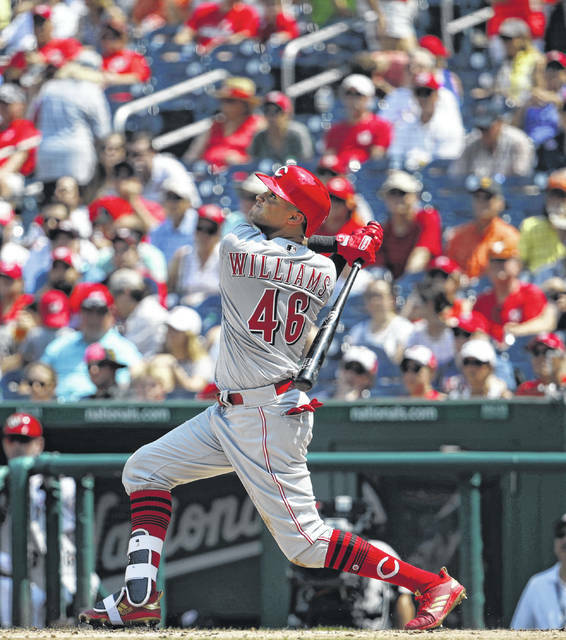 Matt Wieters homered to back Roark, who went seven innings to win his third straight start, and the Nationals defeated the Cincinnati Reds 2-1 on Sunday. The Nationals took three of four from the Reds and have won eight of 11 overall with the second-place Braves coming to town for a four-game series beginning Tuesday. Roark (6-12) allowed a run on seven singles and got a nice ovation when he made a diving stop on Billy Hamilton’s comebacker to end the seventh. Leading 2-0, Roark allowed four straight singles to open the fourth with Mason William’s hit pulling the Reds within 2-1. Roark then retired Tucker Barnhart on a pop to short, struck out Brandon Dixon and got Castillo on a fly to right. In his last three outings, Roark has allowed two earned runs in 22 innings (0.82 ERA) with 20 strikeouts and a walk after going more than a month-and-a-half without a win. There was no carryover from Saturday night’s game — in which Harper and Joey Votto were hit by pitches — until the seventh when Michael Lorenzen’s fastball sailed behind Washington’s Adam Eaton with two outs and Eaton glared at the mound. The Braves managed just one hit against Roark after the fourth. “He’s not blowing you away the way Scherzer can,” Reds manager Jim Riggleman said, “but he’s just a guy who knows what he’s doing out there and keeps mixing it up and had us off balance quite a bit during the day. Nationals: RHP Jefry Rodriguez (0-1, 6.86) and RHP Max Scherzer (15-5, 2.33) will pitch in a day-night double-header that opens a four-game series against the visiting Braves.